Our ancestors knew the importance of preserving food. They did not have stores close by, they were lucky to go two times a year. They probably could not guess what life is like for us these days. As readily as things are available, we should not take this for granted. Over these many years our lives have gotten busier and busier, the manufacturers saw this and created convenience foods, quick meals, quick clothing and there is nothing wrong with those things but we need to make sure we can do things for ourselves as well and teach our children too. I know it is important to keep our skills up. Yes, it is true you can buy a loaf of bread fast but what if tomorrow you couldn't? What would you do? You would have to find recipes right? Then you would need ingredients. Okay, would you have those on hand? Then would you have the equipment? 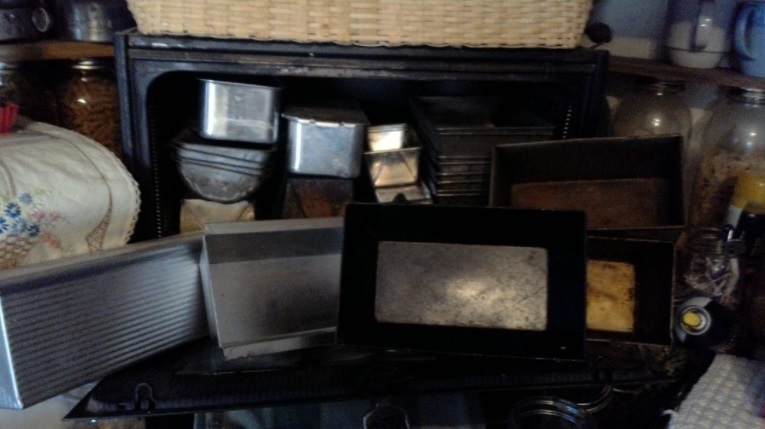 Pans, large bowl, measuring cups and spoons? So you see being prepared means you would have all of that and the knowledge to do it. If your family isn't used to homemade bread they may think - "I am not going to try it." Especially if you don't know how to make it. The bread I first made was inedible and could have been a foundation block...yep. I had a doctor once tell me when I mentioned I made our bread, that she wished more people would make their own bread there would be less mental illness. That is something to ponder, yikes. 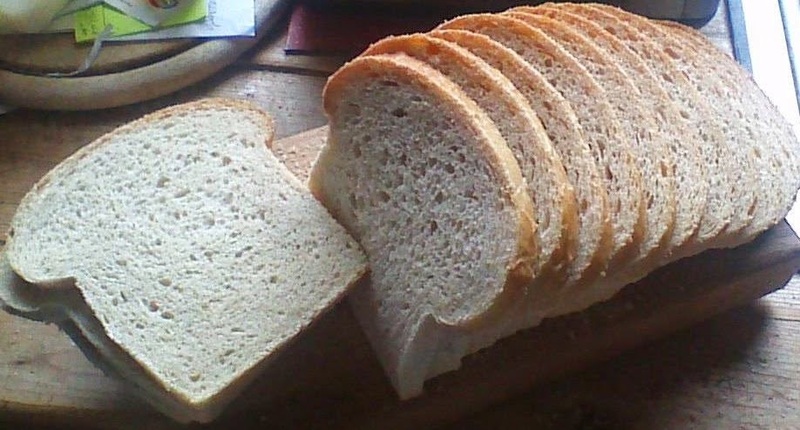 So back to if you could not get bread. Yes, there are other things to eat, I was just using bread as an example. You would have a harder time if you had to gather ingredients and figure out how to make it and what to cook it in than you would if you were prepared for it. I have a friend who would go into people's homes to help them budget better and was so surprised when they never had pots and pans. The ease of going out to eat had made them get rid of their cookware. I know this sounds extreme but we are not talking about one person, many did this so when working with them she had to teach them to cook and give them recipes. Can you imagine not being able to to do the most basic things? It is very important that we never let the ease and the fast pace of things prevent us from learning, knowing and doing. So this is why when I give you the bread recipe for the bread machine which helps make it easy to make, I also keep saying to know how to make this bread by hand as well. - http://frugalmeasures.blogspot.com/2014/12/lizas-wheat-bread.html a fantastic recipe. http://frugalmeasures.blogspot.com/2017/02/versatile-bread-mix.html....this is my favorite of all. 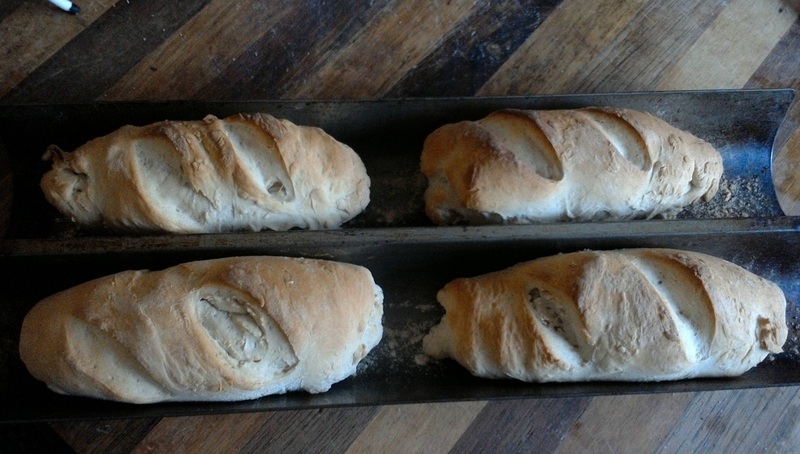 http://frugalmeasures.blogspot.com/2014/08/delightful-french-bread.html - this is truly delightful. This was a test to see if I could do by hand. The bread was good as machine bread and there was no difference. How are you coming along on your skills? I was recently reminded of these scarves. There are many brands that make this type of yarn. You do not even need to know how to knit to make this scarf but it could help you to learn the knit stitch. http://www.sewnews.com/blogs/sewing/2013/04/02/quick-easy-infinity-scarf-sewing-tutorial/ - this is another easy beginner project for sewing. For crocheting -https://www.mielkesfiberarts.com/Diagonal_Hotpad.pdf these are step by step by step directions. https://www.gracefullittlehoneybee.com/30-items-can-make-home-save-money/ I love this gal's stuff. So look around on her site for great frugal ideas. https://www.gracefullittlehoneybee.com/35-frugal-recipes-to-make-when-youre-broke/ sometimes you just feel like you need helpful info, she has that. So keep working at your storage and skill building and comment below. We all learn from each other! Your bread looks delicious! We make a loaf of wheat bread every week in the bread machine. This is our 2nd bread machine in 25 yrs. The first was a wedding gift. The second was purchased at our church rummage sale for $5!! I used to make bread regularly, but I have bad tendonitis in my wrists and the kneading is very painful. If I had to, I could make it on days my husband was home and let him knead. There's a good recipe for Cuban Bread in The Tightwad Gazette that doesn't require kneading, but it's a round bread rather than a sandwich-style. I smiled at your doctor's comment. I think that lots of problems in our world today would be solved by people adopting the skills of their ancestors. I do believe that "idle hands are a devil's workshop." When one is busy all day and exhausted at night, it's hard to have time for mischief! With all that work comes a sense of accomplishment and a good work ethic. I'm always rather stunned when I hear someone say that they're bored. HUH?! When my mom lived with us in the years before she died, I'd peek in her room just to check on her. She'd be sitting in her chair with yarn all over her lap, a pattern on her clipboard on top of the yarn, & the tv on pro baseball. I'd ask what she was doing. She'd inevitably answer something like, "I'm very busy! Very very busy! I have so much I need to get done." It always made me smile. My Mom always said that kneading bread by hand was the best stress reliever she knew of and she is right! An Italian friend of mine who bakes bread by hand told me once that you have to bake bread regularly to keep the yeast in your kitchen and that the more you bake with yeast the better your bread will be because the yeast is in the air and on surfaces. I thought she was a bit nuts until we had our kitchen renovated and all the yeast was erased. 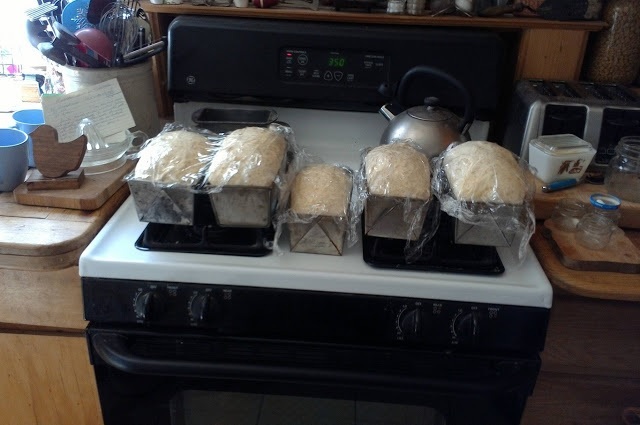 My bread was not at all good for weeks until I got the yeast going in the kitchen once again. your bread looks delicious! i bake my bread,too. 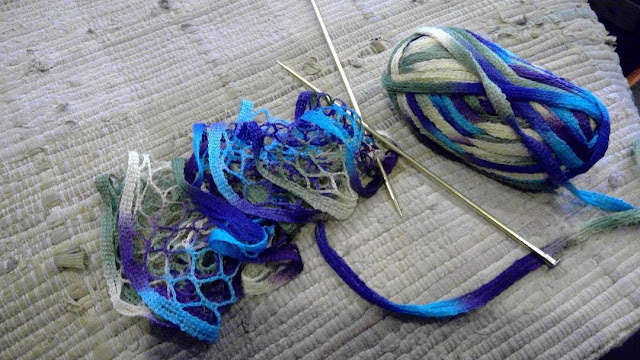 i knitt socks etc., i crochet grannys,make pottholders,grow my own veggies and fruits,make jam and more. i love the books of laura ingalls wilder,especially the long winter. 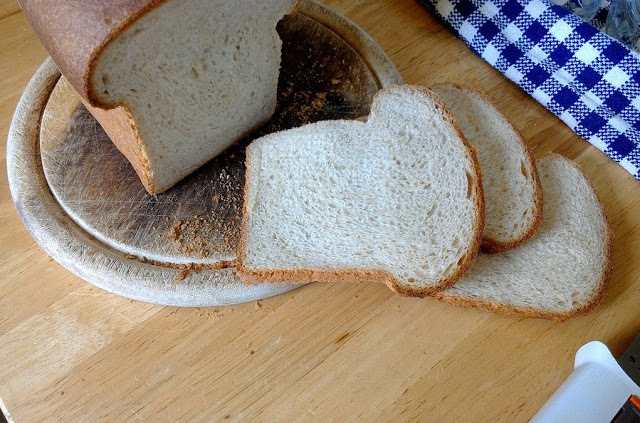 How do you store your homemade bread after it's baked? We live in a very humid area (Tennessee) and I find, especially in the summer months, that I need to store ours in the fridge, so it does not mold. I even have to store some store bought bread in the fridge (even with the preservatives) or it will old as well. My youngest daughter is gluten free. Buying a loaf of GF bread is $5 and a third the size of a normal loaf. I made her a loaf of GF bread in the bread machine and a batch of banana chocolate chip muffins yesterday at the same time. I froze half of the bread and half of the muffins. She is good for 2 weeks now. 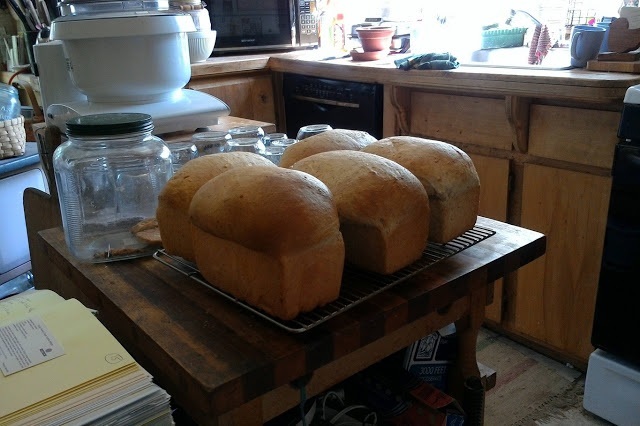 I have 2 bread machine(1 was free) and I love them but we still make bread by hand. Certain kinds don't come out well in the bread machine such as cornbread and my dutch oven bread.